Expect windy and cloudy conditions Wednesday, according to the National Weather Service in Brownsville. Wednesday’s high temperatures will be in the lower to mid 60s across the Rio Grande Valley. 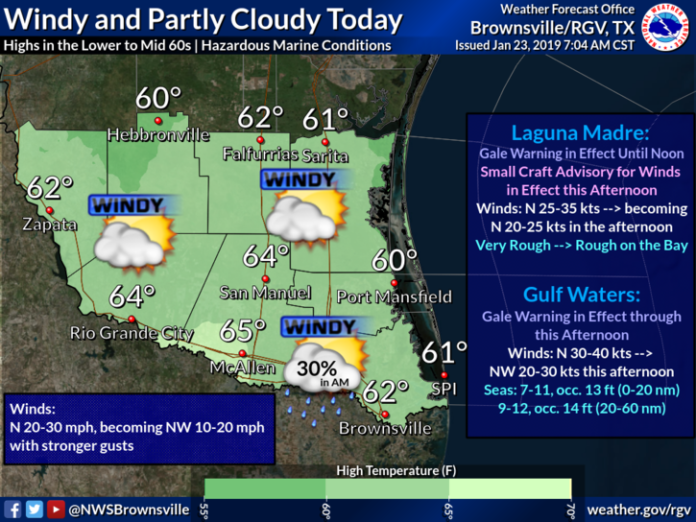 McAllen will see a high of 65 while Brownsville will reach 62. Willacy and Cameron Counties are under a wind advisory until noon. Winds will be between 30 to 40 mph, with gusts up to 45 mph. Similar to Wednesday, sporadic power outages are possible.